Cleo is our very first cat who moved with us to Scotland, she was unfortunately involved in a RTA a week before our wedding day in 2000. Cleo lost her rear left leg and sustained a vertical break of her front right leg which was subsequently pinned and plated. Needless to say our honeymoon was put on the back burner to pay for her treatment but it was worth every penny - Cleo made a steady recovery and 8 years on she is still going strong, ruling our house and all those in it! A few weeks after our adoption of Jack and Hannah, the branch homing officer gave us a call with regard to Fizz (Fizz also has 3 legs like Cleo). How could we say no? 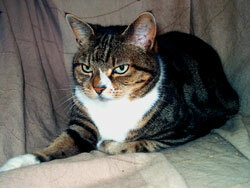 Fizz came home with us and that made 4 in July 2001. Things stayed like that for some time until one cold bonfire night in 2005. Guy was Keren's first trapping experience. Guy had to be trapped because he was very nervous of strangers but he was very hungry and no sooner had we set the trap than he was in it and munching away on Marks and Spencer's gammon! All our foster spaces were full at the time and considering it was bonfire night we were reluctant to take him to another fosterer so Guy made himself at home in the spare room and that's where he stayed. Guy is a Burmese cross and carries all the typical Burmese traits, he likes things his own way! So 4 became 5 in 2005. 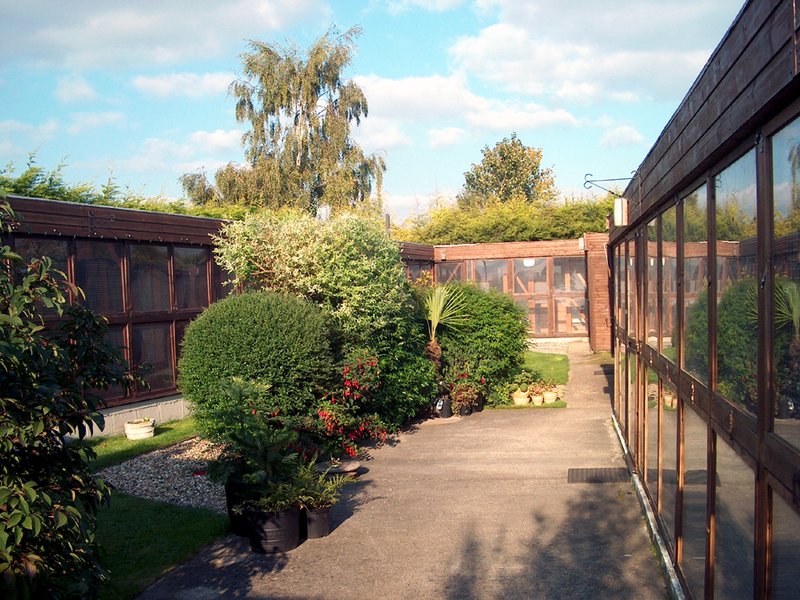 During 2006 we made the decision to move back down south, we were beginning to wind down our involvement with Cats Protection in preparation for the move. 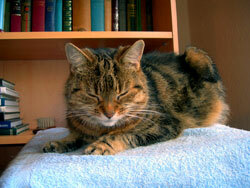 All our foster cats had been rehomed except crabby tabby Tilly. As moving day got closer and closer and still no phone call for our old girl, the course was pretty much set really and Tilly moved with us. So that made 6! Tilly was with us for another two and a half years after our move to FBC before she sadly passed away – as we're sure you can appreciate Tilly was well loved, is sadly missed and fondly remembered. Baggy joined us as cat No. 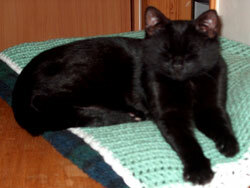 7 in October 2008, our first experience of kittenhood as we've always adopted older cats in the past - he has provided many hours of entertainment and much laughter during his first few months with us. 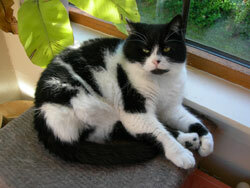 Baggy settled in well with the other cats - once he’d realised that Granny Tilly’s tail is NOT a toy! He adores Uncle Guy and follows him everywhere, much to Guy's annoyance! 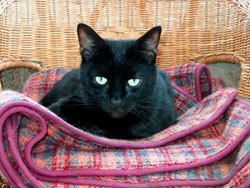 But his very best friend is Auntie Cleo who appears to be going through her second kittenhood since Baggy arrived. We’re not sure who’s worse out of the pair; needless to say Christmas was kitten chaos in our (now full) house! Tilla and Dora originally came to us for rehoming but after 3 months of trying (without success) they moved in with the rest of our cats and our feline family became 9… Tilla is a real lap cat and the only one of the nine who likes a proper cuddle – he’s a big softie and Dora is very cute with her neat feet – she just adores catnip and the only one of the nine who gets just a little bit crazy with it!!! 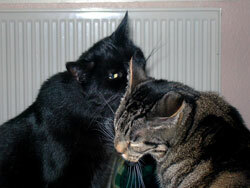 With Tilly's passing in January 2011 we were an 8 cat family for about 6 months or so until Miles came along - his story is quite a sad one and so he holds a very special place in our hearts. Miles was originally a stray taken on as a 'pub cat' in Cambridge by a fine gentleman called John – a big ask as Miles suffers from three relatively serious conditions – hyperthyroidism, cardiomyopathy and chylothorax. In the spring of 2011 John was very poorly and spent a number of weeks in Addenbrookes Hospital during which time Miles boarded with us (as we were able to continue Miles’ strict medicine requirements and feeding regime). Throughout John's illness his concern was only for Miles' welfare, so when John sadly lost his battle in early summer and passed away, we knew that the right thing to do was to adopt Miles ourselves. The chances of a rescue organisation finding another 'John' to take on Miles' ills would have been remote and Miles was settled here with us, his conditions reponding well to treatment and so with the blessing of John's family, Miles took his place as our number 9 feline … He fits in a treat with the rest of our motley crew!